We design and manufacture the right sensors for the tanks on your machines or vessels related to your equipment. At the latest technology and a result of long years, we also examine sensor materials, as well as their forms and mechanisms, and design sensor electronic circuits. Also we propose special shaped sensors for use in special environments and difficult applications. Please feel free to contact us. 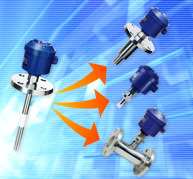 At the latest technology and knowhow and a result of many years, we propose a best custom sensors that satisfy the various requirements for each of industry types to accommodate the diverse needs of various industries. Show an exsample of its application below. Can be stable detection and measurement strong viscous liquid of adhesion and fixation, such as slurry and syrup without causing malfunction. The level meter corresponding to the powder and granules. Can be stable detection and measurement without malfunction even if the powder is adhered and deposited. This video introduces powder and granules. Can be detection and measurement the interface of 2 liquids such as between oil and water. This video introduces interface detection. Can be detection and measurement foam and without counting foam. This video introduces detects foam. When you need to detect and measure levels stably, you really need a sensor that matches your requirements and conditions. Depending on the size and shape of the vessel in which sensors will be installed, the types of material to be measured, and the measuring conditions, we design and manufacture to match with customers' specifications. Below we describe the procedures for designing and manufacturing custom sensors, using a capacitance sensor as an example. This is the position to connect the sensor on a vessel or pipe. Type (flange, screw, ferrule, etc.). This is about the length of the sensor electrode that will be inserted in the tank, vessel, or in plumbing. Set the length so that the sensor will be able t sense the measured material without any problems. The shape of the electrode, including its length and diameter, must be examined in terms of the installation conditions of the sensor electrode and the details of the material being measured (i.e., when installing the electrode in a tank, will it hang from above or go through the tank wall). This section describes the materials used to manufacture a sensor electrode. Determine the materials for making the electrode itself that configure the electrode, as related to the material being measured and the use environment. This is an electronic mechanism to convert detected signals into electrical signals, and output them. We will select the optimal amplifier by the types of material to be measured, and the input power supply, the electrical signal output system. Design and development of special sensors in a special environment. In addition to the above general custom orders, also we can design and development sensors to match your process and equipments in special environment. At the latest technology and extensive know-how and result of longtime, we propose a more optimal sensors. Below we give as an example. At customer's request, we have designed of perfect waterproof type continuous level meter. Can be control the remaining amount of the liquid at the sensor installed any position in the liquid and liquid surface. Can also measure continuous of the amount of remaining liquid at the sensor installed in the bottom of the liquid. This video introduces perfect water proof. Also a small level meter corresponding to small containers, we designed a level meter in a harsh environment of high temperature and high pressure, etc.. By using small precision amplifier, can be various measurement in the limited space. This video introduces small type. Can be detection to substances with a low specific inductive capacity, such as toner, silica, film, and milk powder. Can also detect powder and granulated material with a low specific gravity, and insulating bubbles. This video introduces high sensitivity. Can be measured the liquid remaining amount of liquid inside the tube, the glass tube, a small container from the outside without contact the liquid. Prepared a various amplifier for the material to be measured. Not only detection point ,can be measure continuous a liquid level. May need to level detect in a high temperature and high pressure environment in a complex manufacturing process, such as chemical plants. At customer's request, we designed of sensor in Ultra-high temperature from 300℃ to 700℃. Also we designed of sensor in Ultra-high temperature -200℃, such as liquefied gas, LNG. We can design and manufacture sensors for various liquids and powders. A variety of capacitance sensor amplifiers, not just the standard capacitance sensor amplifiers, is provided to suit various requirements. For example, you can choose a highly sensitive type.We can also deal with the following applications, as well as material level measurement. • Measure mixed ratio of two different liquids. dielectric constant of the two liquids must be different. • Measure the water content of a liquid. • Our sensor can measure in harsh conditions such as high pressure. 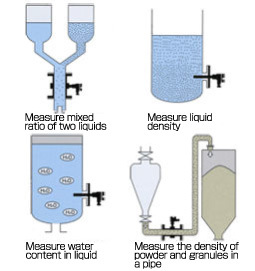 We welcome any request to measure various liquids and powders. Click the PDF file below and fill out the required items concerning your requirement for sensor specifications. Then send it to (FAX:06-4805-3528) by fax. * PDF file pages for specification of each product are now under construction. * If you need a specification confirmation form, please ask our sales staff.